Can perspective fix all our problems? November 2, 2013 9:20 pm / 2 Comments on Can perspective fix all our problems? Imagine this all to common scenario – Billy and his friend Ricky are talking one evening over dinner. Both of these men are adults, have jobs, most of the needs are met, but Billy still feels depressed. “Look Billy, you only feel how you want to feel, you just have to change your perspective!” says Ricky. “Easy for you to say. I try to stay positive, but no matter what, I just wake up feeling like the world is against me. I’ve been so sluggish that I’ve even called in sick a few times just because the stress was too overwhelming,” says Billy. “What do you mean? Work bogging you down with some crazy projects? You shouldn’t get so worked up!” asked Ricky. “No, just the idea that I would have to be at work. Stuck in the office, working in a system where I don’t really matter, feeling the judgement from co-workers, and getting nit-picked by managers…” Billy trails off. “Just think about this. You have a job, you have a place to stay, you have a car, a degree, and everything you could ever need. The only person making you feel bad is you! You need to start looking on the brighter side and you’ll see! You only feel as bad as you CHOOSE to feel!” exclaims Ricky. I know I have heard this conversation and have even been a part of it. I’ve had people tell me that perspective is the one and only thing that matters. Perspective can help in some cases, such as someone having a warped or maladaptive view of the world. How did they begin to have this view? Was their warped perspective a result of maladative thinking, or were they unable to thrive in their environment? Perspective is certainly important, but our Western ideology puts too much emphasis on the person and not enough on the situation. If we look at our imaginary friend Billy, we can clearly see a problem with his environment that creates his emotional response. Even if he should feel fortunate to have a job, it sounds like he’s being forced to use a large number of free-traits. As Brian Little’s theory suggests, usage of free-traits comes at a price. Just to review, a free-trait is used when we adopt a personality that differs from our own in order to meet the demands of our environment. The greater the difference between the adopted personality and our natural one, the greater the stress. So it is fair to say that in our example, Billy’s excessive sick days, and stress, are a result of a miss-match of personality and environment. This doesn’t necessarily mean that he is a poor fit for his job, but he may not fit in with his co-workers. He may not feel a trusting relationship between himself and teammates, or himself and management. Feelings of isolation are not created out of thin air. We feel isolated as a result of being avoided and disregarded in social contexts. My adrenaline kicks in. I rush towards him, and kick him in the head. I fought, thus I am angry. The physiological response is identical, but the actions that are created define the emotion. I am angry because I attacked or I am fearful because I ran away. Either way, my adrenaline was released. Our perspectives define the behavior after it occurs, so how could my perspective possibly change my reflex? We’re talking about reflexes that bypass the working memory. Recall the dual-process of memory results in a majority of information being processed without conscious thought . Clearly, your mood at the time of the event could alter your physiological state, which could be the result of a perspective. However, at the reflex and response level, physiology reacts prior to executive-level cognition (choices and decision making). Thus I had a physiological response first, then I analyzed my situation afterwards. 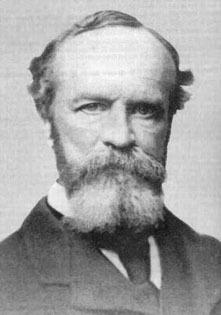 William James originally authored this model of emotions (James-Lange theory of emotions). Our descriptions of our physiological states are what define an emotion. Every emotion we have is a chemical mixture. Fear goes hand-in-hand with adrenaline, while happiness is expressed through dopamine and serotonin. These states are almost always the result of our interaction with external stimuli (not in all cases). What does this mean for someone like Billy? Perhaps instead of using his perspective to change his mood, he should change his actions to alter his mood. After his actions have altered his mood, he could lift himself out of his slump and feel more positive. Some may argue that the choice to be proactive is then the changing of perspective. Instead of argue over the proverbial chicken and egg, we will label this argument for what it is. Emotion focused coping versus problem focused coping. To simply change your outlook to improve your mood is actually unhealthy in many cases. If we ignore our stressors and do not act to change them, we will be forced to adopt Free-Traits. If we act to change the parts of our lives that we can control (problem focused coping) then our emotional state will improve. To improve emotions, you simply act. You do not act on the emotions, however, you act towards the ones you desire. If we follow the James-Lange model of emotion, you can allow yourself to create behaviors related to the emotions you wish to feel. I’m reading a book: There’s a twist ending that I did not see coming and I’m excited! I’m reading a different book: There’s a twist ending that I did not see coming and I’m scared! In both of these cases, the events are being interpreted in my working memory as they occur. I’m not using a reflex to act, I’m reading and visualizing the events. I would argue that your emotional state is completely fabricated by the cognitive experience. Fabricated or not, you have a real emotional experience as a result. I read a research paper. I think about it all day and I eventually get a great idea! I’m excited! Once again the emotional state was not created by the physiological response – it was created by my working memory. I didn’t suddenly feel a rush of adrenaline and then come to a grand discovery, I made the discovery and that caused the emotional response. Once again, this did not use a reflex. My imaginary discovery was a thoughtful process. I know there may still be some doubters, but this TED talk by Amy Cuddy might change your mind. Her talk is entitled “Your body language shapes who you are.” That wording itself is very important. If you do not care to watch all 20 minutes, skip to about 10:30 into the talk and you can see her experiment. I’ll summarize it below as well! Participants were instructed to be in either a high power, or low power pose. An example of a high power pose is standing up straight with your arms on your hips and legs shoulder width apart. A low power pose is one where you sit or stand keeping your body smaller (crossing your arms, touching your neck or face, etc). Participants held these poses for two minutes. Their resting levels of testosterone and cortisol (stress hormone) were measured before the getting in their pose. Those in the high power poses had a 20% increase in testosterone while those in the low power poses had a 10% reduction in their testosterone. For cortisol, those in high power poses reduced their baseline amount by 25% and lower power poses increased cortisol by 15%. Something as simple as a different pose can dramatically change how stressed we are or how confident we feel. Seemingly simple behaviors can be quite powerful. In conclusion, I try to avoid “one size fits all” remedies like “just change your perspective!!! !” Just changing your perspective won’t solve any problems. If one only focuses on behavior, one will come up short as well. I do believe, however, that far too many people disregard the power of behavior and instead focus on introspection. As discussed, introspection used for emotion focus coping is actually quite toxic. Thinking through your problems is important, but never more important than actually solving them. After a year of posting I feel like I’ve put off talking about my own research for far too long. My thesis project was part of a set of studies that had been ongoing for a few years before I joined my master’s program in 2009. I was unsure about joining the research lab because my focus was on social psychology while they were investigating eyewitness memory (cognitive psychology). Since the lab used cognitive-behavioral research methods, I could use the experience gained here with just about any other lab. Even if their research was not my main focus, it was still a good opportunity for me to learn about methodology. I worked with another graduate student who wanted to create a simple intervention to help people improve their eyewitness memory. Basically, participants sat in front of a computer screen where they were shown faces. Each face would appear for three to five seconds (the timing was altered in a few version of our set of studies) and was in the center of the screen. They also see geometric shapes with different fill patterns, and nonsense word pairs. Examples of our stimuli can be seen below. So far so good right? The participant simply looked at the face, pattern, or word presented and tried to remember it for the test. A simple memory test would mix in items they had never seen with items that were on their study list and their task would be to determine if the item was old (one they studied earlier) or new (one they had never seen). Our test was a bit more complicated. The top two items of each set are images you may see during the study portion of the test. The item below the pair is a recombination of the old items creating a new item. For faces, the outer features (hair, ears, chin) are combined with the inner features (eyes, nose, mouth). For shapes, outside shape is combined with inside fill color. For words, the first word part is combined with the second word part. The resulting image is a recombination (also known as conjunction image). The participants were tasked with identifying items on the study list as old and all others as new (completely new items and the morphed items). Even though the recombined morphed images were made up of old parts, they were still required to identify them as entirely new items. Different colored fill patterns would be used with different shapes. For words, old prefixes would be added to old suffixes. There are a few key terms with this kind of test. First, when someone correctly identifies that an image is old or new, we call it a hit. If they call an old item new, this is called a miss. If they call a new item old, however, we call this a false alarm for our study. As you may imagine, misidentification for an eyewitness is a dangerous problem. Thus, we always try to find ways to reduce the rate of false alarms without making people overly skeptical of themselves. Why else might we use recombined images? Theorists have shown that human visual processing is not a simple matter of remembering a distinct feature about someone’s face (such as having a large nose). Experts have shown that it is the unique way the parts combine together which makes up an experience. Below is the famous Ponzo illusion which you have probably seen. It’s not just for fun; this illusion actually has a practical application that I’m about to explain. Even when you know the top line is the same length as the bottom one, we still perceive it as being a different length. I cannot stress this enough – your brain will automatically interpret stimuli from the perceptual level, and when that message gets to your working memory, you can finally begin to process the items individually. Your brain is telling you the lines are different before you have the chance to begin thinking otherwise. This example supports the theory that human visual processing is configural – we perceive items based on their relationships to other items! While we may remember the distinctive features of some faces, such as a person with a large nose, we still only remember it based on context. Perhaps that nose looks too large compared to the other features on the face, but if it were placed on a different person’s face, it may appear to be too small. We remember details based on their context! A quick note about the patterns and the words – if human visual processing is completely part-based, we should have a good memory with random shapes and words too. However, we know with a high amount of confidence that the brain uses different parts to process faces and other objects. Most objects are processed by a part called the “parahippocampal place area” (brain part near the hippocampus) while faces are processed in the fusiform face area. Some other theorists suggest items that we are exposed to frequently (item expertise) are processed in the fusiform area – it’s not just for faces. It only appears that way because faces are something that most humans are exposed to more than almost any other objects. There is still a bit of debate, but I wanted to show why we used faces, patterns, and words in the study – to help determine if visual processing was configural or part-based. Now back to the experiment! As you may have guessed, when a participant saw these recombined morphed images, they had a higher rate of false alarms (they reported the morphed faces as one they had seen). It’s a fairly hard test, so that should be expected. As I mentioned, we did have an intervention in mind. Using this method we gathered our data over three instances of this study. What did we find? Unfortunately, we failed to observe any effect for feedback. This was a bit upsetting, but that’s the scientific process for you. A lot of theories suggest that eyewitness memory is not something you can improve after the memory creation. At this point, I wanted to add something new to the study. The focus of my master’s program was personality and social psychology. While administering this test, I noticed that some participants seemed more invested in their performance than others. When the feedback told them they made a mistake, they appeared to sigh. When the feedback said they were correct they would sometimes nod or crack a small smile. On the other hand, other participants seemed completely unmoved by the feedback. With my exposure to personality psychology, I theorized that personality factors might make someone more invested in their performance, even on a simple test like this one. I pitched the idea to the head of the lab, but he thought a broad personality test lacked precision. If we wanted to measure something, it needed to be directly related to what we observed. After a bit of back and forth, we settled on measuring competitiveness. This seemed appropriate as the subjects sat in the same room together, though not in direct competition with one another, and were aware of other people taking the test with them. Furthermore, it seems reasonable that someone with a high level of competitiveness would want to achieve the highest accuracy rating possible. I searched around for a good way to measure competitiveness and settled on a test devised by Smithers and Houston (1992) as it was shown to be a good predictor in a meta-analysis of measures of competitiveness in 2002 (Houston, McIntire, Kinnie, & Terry). 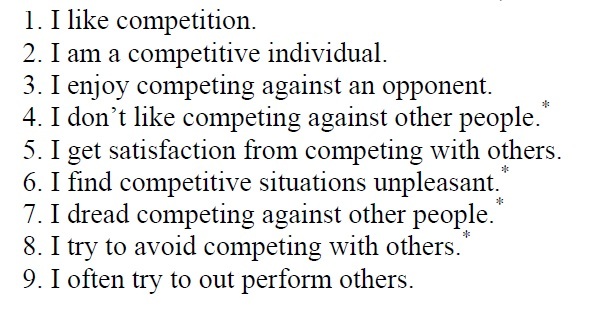 The questionnaire measures competitiveness in a fairly straightforward way while asking questions like “I often try to out perform others” (rate your agreement on a 1-5 scale, 1 being strongly disagree, 5 being strongly agree – see below for more examples). A total of 17 questions measured competitiveness and we decided to place them at the end of the memory test. In most cases you want to randomize the presentation of materials, but in this case we felt that alterations to the testing method for the eyewitness portion of the study should be avoided. Items marked with an asterisk are reverse coded (agreeing to reversed items means you are less competitive). There are a few more questions that this in the actual tool, but as you can see, the questions are fairly simple. Over the course of the summer of 2010, I gathered the data for this study. After a bit of digging, we found some interesting results. We discovered no effect for feedback on pattern or word memory at all. One could conclude that our method had no effect on part-based memory. We observed a small difference between groups for rate of error with recombined (morphed) faces. Participants in the control group appeared to miss them slightly more frequently. Interestingly, the control group’s miss rate was highly correlated with competitiveness. When a highly competitive individual responded, they were more likely to mistakenly identify a morphed face as a face they learned on the study list. In the feedback group, however, the competitive and non-competitive people responded with the same accuracy! As shown above, we can see a large interaction effect here. The group receiving feedback (the blue line) does not show a relationship between accuracy and competitiveness (hence a flat line showing no correlation), while the control group (the black line) does show a strong relationship (the steep line showing nearly a .70 correlation). So if you are competitive, and you do not get feedback, you have a higher false alarm rate to those recombined faces! Since this was not a test-retest method, I cannot really say that the feedback condition caused a change in behavior, but it seems to be very probable. It would appear that the effects for competitiveness can be completely mediated by our intervention, but more testing would need to occur for us to come to this conclusion. This was a great grad school experience. Getting to work hands-on with real research was interesting, and getting the chance to test my own hypothesis was quite meaningful. On top of that, the experiment turned out to show a really strong effect. I wish the resources would have been available to replicate the experiment while I was still in school. I would love to see the material published, but my lab did was not focused on personality or social effects. Support came from my lab-mates and professor, but they did not have the same background as me, so continuing the studies after I graduated proved difficult. Overall, I found the experimental process to be very rewarding. Any time you can show the power of personality psychology in action is a success to me! Can video games alter our behavior? Our behaviors are shaped on a daily basis through our interactions with our environment, and even something as seemingly innocuous as a child’s video game could alter our behavior. However, the effect of gaming is not as straight forward as the media has led us to believe. If we expose ourselves to an environment, it could influence our attitudes, but it rarely dictates our behavior. Let’s begin by looking at a few examples of psychology studies involving video games. First, we’ll see how video games can be bad for us, then how they can be good for us, and then discuss the interesting difference we observe between new and veteran gamers. 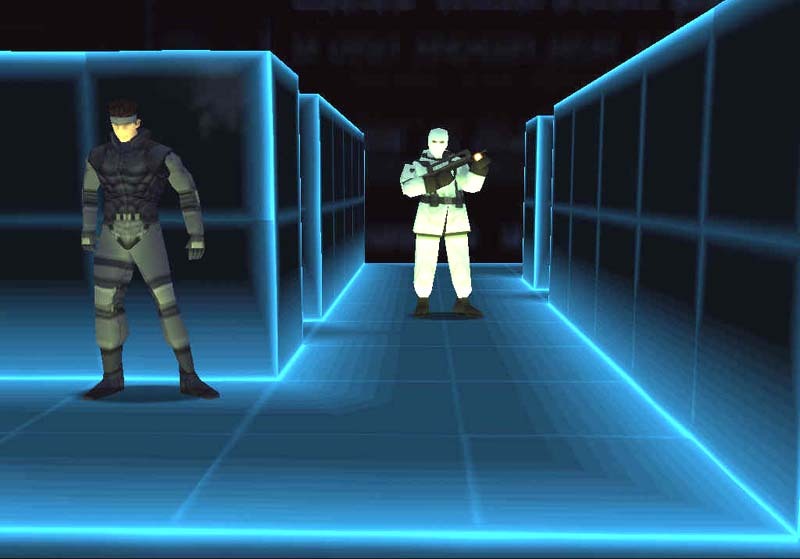 Pane and Ballard (2002) authored an interesting study using Hideo Kojima’s “Metal Gear: Solid®.” A group of male college students played the game with two different sets of instructions. 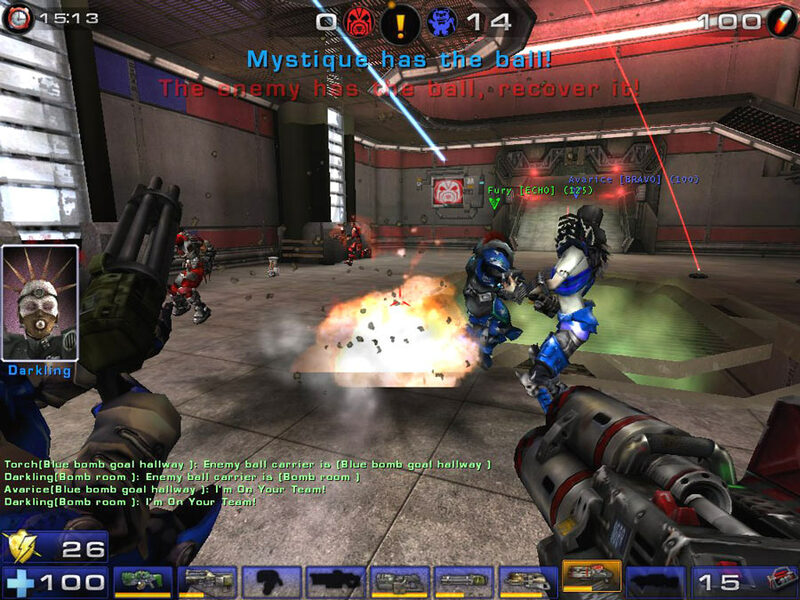 The game had a few training missions, and the player could complete the missions by either using stealth, or aggression (shooting the enemy or using close combat). Each group had to complete a tutorial mission, but the group had different instructions. The first group was told to kill all the guards in order to proceed to the next stage, while the second group was not given any special instruction other than to reach the exit of the level (if they chose to, they could attack the guards, or sneak by). Afterwards, the participants played through five more training missions. As expected, the players who were told to dispatch all of the guards in the first phase were more likely to use aggression to complete the remaining levels. We cannot say that made a player more ‘aggressive’ in the real world, though. Perhaps forcing them to kill the guards made that response more practiced, and easier. What about a real world change? The authors measured hostility levels after the participants finished playing the training mission and the additional five levels using the Beck Anxiety Inventory (BAI). The authors found that the participants who made the highest number of aggressive actions in game had the highest levels of hostility according to the BAI. Before anyone gets too bent out of shape, we’re not saying that this game forced someone to be hostile towards their fellow man. Hostility does not mean they are going to go on a rampage, but they may end up starting to have a few anti-social behaviors when they are primed by these environments. So games hurt us? Not so fast! Greitmeyer and Osswald (2010) authored a study using two of gaming’s finest classic titles – Lemmings®, and Tetris®. The authors wanted to show a few different things. First, not all games are doomed to cause bad behavior, and second, priming is only functional when someone has the chance to act! 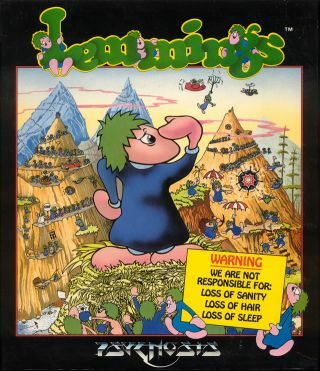 In the game Lemmings®, the player is trying to help get all the lemmings to safety. The player is only able to advance to the next stages if they save most of the lemmings in the level. Since the goal of the game is achieved by saving and helping, no real violence involved at all (unless you kill the poor guys on purpose!!! ); it’s considered a pro-social game. Anti-social, on the other hand, would be things that promote hostility and violence. In this study, there were two groups. The first group played Tetris®, while the second group played Lemmings®. The Tetris® group was considered the ‘control’ group as Tetris® could not really be classified as pro or anti-social. Both groups would play the game assigned to them for a short period of time; then the real test began. In the first version of the study, the groups would play their game and then a research assistant would ask the participant to fill out a survey. The research assistant would simply drop a cup of pencils all over the table near the participant. The researchers found that the Lemmings® group was significantly more likely to help pick up the pencils compared to the Tetris® group. In the second version of the study, the participants would finish playing the games then begin filling out the survey (with no pencils being ‘accidentally’ dropped). This time, a female research assistant would be sitting in the room with the participant while a male actor would enter the room. The male actor would begin to ask the female research assistant to come with him but she would ask him to leave. He would continue to get more and more aggressive (verbal aggression only). The researchers found that the Lemmings® group would ask the man to quit harassing the research assistant significantly faster than the Tetris® group. Now you might be asking why they didn’t choose to compare a pro-social game to an anti-social game. They did, in fact, in the preliminary studies. They found that the difference in behavior was so vast, that it did not need to be reinvestigated each time. The authors wanted the reader to focus more on the potential positives of games instead of overly focusing on the negatives. So yes, anti-social games led folks to be less likely to act (even less likely than the Tetris® folks). The real key thing to stress here is that a behavior was primed and it was given a chance to be expressed almost immediately. Just like with subliminal priming, one should aim to “strike while the iron is hot.” When something is freshly primed, it should be more likely to change behavior. This study was not intended to test the duration of the effect, just the presence of the effect. Regardless, I feel that priming a behavior, then allowing it to occur in such a staged manner is actually even stronger than any priming effect alone. By expressing these behaviors, we would form contingencies of self worth around them, and begin to defend our actions. We would probably decide that the reason we were helpful was not because a game planted the idea in our head, but because we feel good when we help others. I’d love to investigate this idea of “priming leading to further priming” but that’s for another day! So we can see how gaming can be good or bad. Some games like Valve’s hit “Left for Dead®” have a mixture of these behaviors. 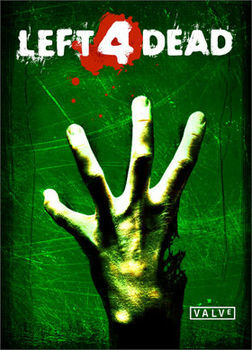 In this game, four human survivors are battling through hordes of zombies to find supplies and safety. Some enemies completely disable you and unless your teammates come to save you, you cannot possibly escape. This game really emphasizes cooperation above all other factors. Failure to cooperate means your team will definitely fail. I believe that a game that rewards cooperation, more so than being accurate with a gun, would end up having a more pro-social effect than more neutral or hostile games. If I was given the chance, I’d love to investigate it! However, this is my speculation. The only way to survive is with teamwork! This example was to simply show that not all games are easy to classify as pro or anti-social. This game is quite violent. While the image does not display it, body parts are often flying across the screen, heads are being blasted off, and mayhem is everywhere. New players to these games are often caught up in the aesthetics instead of the goals. This is a very important difference – the presence or absence of goal oriented behaviors! Participants in this study who had never played the game were asked to play it for a period of time. Afterwards, participants were tested and the researchers found that new players had an activated aggression construct. This may sound strange, but it’s just like the Glass Slipper Effect discussion – word pairing were displayed, and when pairing words related to aggression, you will respond faster when the aggressive construct is primed as it causes the least dissonance. What about the veteran gamers? In this study, these gamers didn’t necessarily play Unreal Tournament®, they just played games in general. The authors found that there was no effect for the veteran group. Playing this extremely violent video game did not cause their ‘aggression’ construct to become primed at all. How should we interpret this? The difference here is that the veteran player cannot afford to be distracted with the visuals, they are focused on where they need to be, where they should aim, which spots pose a threat, and how they should respond to it. It’s not just about blood and gore, it’s about strategy once a player has enough experience to conceptualize it. Until that time, however, the aesthetics will probably change their behavior. In conclusion, games can influence your behavior! Pro-social behavior, anti-social behavior, any behavior really. We must be careful what sort of environments we allow ourselves to experience. That said, once we have enough experience, the effects of that environment are completely mediated as we begin to use more goal oriented behaviors. So is gaming good or bad? Neither, of course! I’d say it’s a bad idea for parents to let their 8 year old kid play a mature rated game. Those things have ratings for a reason – pay attention! Gaming should be done responsibly, just like any other form of media. It’s not evil, it’s not bad, it doesn’t force us to do anything, but we should be aware that it has the potential to change our attitudes! Please folks – game responsibly! 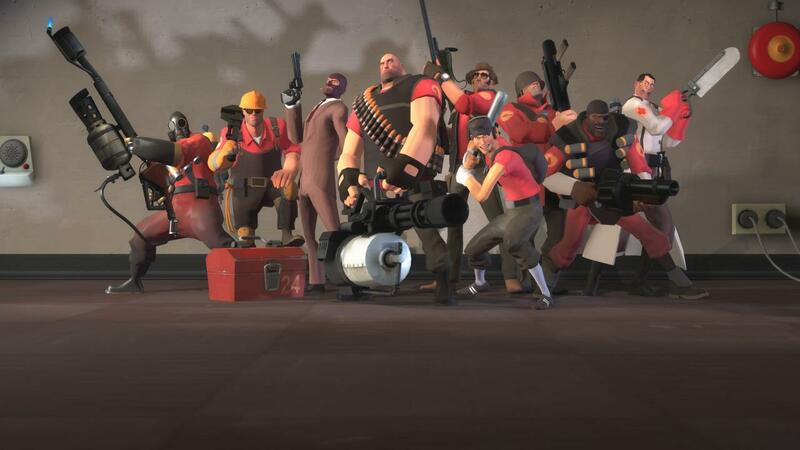 As for me, I’m off to play some Team Fortress 2! Greitemeyer, T, & Osswald, S. (2010). Effects of prosocial video games on prosocial behavior. Journal of Personality and Social Psychology, 98(2), 211-221. Panee, C, & Ballard, M. (2002). High versus low aggressive priming during video-game training: effects on violent action during game play, hostility, heart rate, and blood pressure. Journal of Applied Social Psychology, 32(12), 2458-2474. Glock, S, & Kneer, J, (2009). Game over? The impact of knowledge about violent digital games on the activation of aggression-related concepts. Journal of Media Psychology, 21(4), 151-160. In my last post on Skinner’s theories on learning, I mentioned the potential misuse of punishment and praise. It seems plainly obvious how punishment can cause a lot of problems. Excessive and inconsistent punishment of behavior could easily cause attachment issues, maladaptive behaviors that inappropriately associate punishment with benign behaviors, or any number of personality disorders could develop if there is intensity or a long period of abusive punishment. When should we use punishment? It’s a fairly tough call to make. Sometimes it’s harder to support positive behaviors than it is to target a single negative behavior. For example, if my pet dog was jumping onto the furniture, I may try to use punishment to teach the animal. I could use a spray bottle, and spray the dog with a bit of water if it jumped on the couch. After enough consistent repetition, my dog would associate the act of getting on the couch with the uncomfortable spray of water. This could be an effective training method if I’m consistent, and my reaction is immediate. If I’m quick and consistent, my dog will understand that its action of getting on the furniture will prompt my reaction of the use of a spray bottle. Prompt and accurate ‘feedback’ is absolutely vital for successful learning to occur. What about something harder to punish – perhaps something like rude behavior at school? Imagine a parent gets a letter sent home from the teacher informing them that their child has been bullying other children by being verbally aggressive. The child is behaving in this negative manner outside the supervision of the parent, so it will be nearly impossible to give prompt corrective punishment to the child. An adult supervisor, teacher, principal, etc, may be able to help curb this behavior, but the effect of the parent’s punishment will be quite weak, if effective at all. The best the parents can do is ensure they are not modeling verbal aggression, then investigate other sources of verbal aggression among the child’s peer group. A parent’s punishment will communicate that the behavior isn’t acceptable, but it will not be likely to change behavior as much as more prompt feedback when the behavior is occurring. When the child engages in bullying behavior, we must have a better understanding of why the child felt the need to do so, what environmental forces (peer groups for example) were pressuring the child, and if the child was antagonized into action. Simply punishing the resulting behavior of all these forces might not be as effective as looking at it like an equation. The child (learned behaviors from past and home life), the environment (school and peers) plus the stimuli (target of bullying or potentially someone who is provoking) creates the outcome (aggression). As you might have guessed, punishment may just add more examples of parental aggression for the child, thus encouraging bullying back in the school environment. This was just an example of how punishment can further complicate things when we are unable to use it properly. We should only use punishment when it can be prompt, consistent, and precise. Punishment has a massive problem, though. When the authority figure is not present, previously punished behaviors tend to resurface. If the dog associated me with the water spray, it may understand that it cannot be punished while I’m gone! That’s why psychologists tend to suggest reward over punishment for long term behavioral change. Imagine that a student is going through their first few years of school. They are making good grades, doing their homework, getting along with their peers, and enjoying their time in school. The student’s parents see the report cards and almost always see ‘A’s for most of the courses with a few ‘B’s every now and then. The parents say, “wow look at your grades, you’re so smart!” The child hears this for a number of years as they continue to do well up until middle school. A while later, the child starts to do poorly, and begins to feel defeated. Over time their grades continue to slump, but their behavior is not changing. For many students, if they begin to do poorly in a class, they might begin to dedicate more study hours to it, but not this particular student. Why? Well, because they were always so smart, right? What does this type of message do to a child? When someone does well and we say, “Ah, you did well because you are so smart!” it actually causes more harm than good. This is because we are not focusing on the behaviors that led to success, we are only focusing on the outcomes. Just like with improper punishment, if we overly focus on the result, we lose sight of what caused the behavior. As we tell the student, “you did a good job – you’re so smart” it changes their perception of things. They begin to feel like they do not need to work the achieve. The child may begin to believe “the reason I have good grades is because I’m gifted!”. As they are challenged, though, what happens? The student starts to get poor grades in a challenging course, so they will begin to become defensive. “Since I’m smart, and gifted, clearly the test was not fair,” or perhaps “The class must be exceptionally difficult if even I have trouble with it.” This gives the child a one dimensional view – “things are either easy because I’m smart enough to do them, or difficult because even a smart person like me can’t do them.” This is obviously a problem! What we see here is the creation of a contingency of self worth that causes major problems in later life. First, the student learns that praise comes from getting a good grade above all else. Next, the student is challenged by harder concepts, thus avoids them due to dissonance. The student begins to enjoy things that are easy to complete more than enjoying achievements related to harder tasks. Later in life, the student may choose to study something that is ‘easier’ or adopt a lifestyle that is free of tougher challenges. Let’s dissect the contingency briefly. “I am smart because I make good grades!” – This is an external contingency of self worth, which is dangerous. It relies on the input of others for your to feel better about yourself. When the student fails at something, they experience dissonance with their self worth, which will trigger self-serving biases – “I failed because it was unfair, or because this subject is too hard.” The blame is being placed on external places, not the internal issue – the lack of effort or study hours. “I enjoy this task because it is easy to me” – This would be common for many people who were raised with unconditional positive regard. Challenges cause dissonance, while easy tasks reaffirm their external contingencies. Easier tasks are preferred and harder tasks are avoided because they challenge my initial contingencies of self worth. We hope that when a student is challenged by a task, they will dedicate more time to it. This creates an opportunity for teachers, parents, and peers alike to support positive behaviors. When someone achieves anything, what should we say? Even my examples are far too general – The best idea is to point out PRECISELY what was good about something. Accurate feedback is absolutely mandatory, whether it’s positive or negative in nature, for someone to learn. If a student made a good grade, always praise the work they put into it, not simply the outcome! In conclusion, we must praise and punish responsibly. Either way, we must make it clear what behaviors led to success, or failure, when we praise or punish. Understanding the origins of behavior allows to better support our friends and family as we continue to give feedback. With proper feedback, we can help encourage a set of behaviors that thrives off of challenges and hard work instead of focusing simply on gratification and outcomes! When we think of learning, we tend to think of education. A high minded course on critical thinking and philosophy teaching us how to solve the problems of the world without breaking too much of a sweat. Well, education and learning are not really one in the same. When you see “learning” the way Skinner did, at least, you will begin to see it as robotic in nature. Granted, Skinner only focused on the procedural memory and not the explicit memory, so his theories were limited by the understanding of the field at that time. His work was still incredible, but it does not adequately explain all the facets of human behavior. Learning (or operant condition according to Skinner) is a change in behavior due to punishment and reinforcement. Before we can get into learning, we need to go over punishment and reinforcement first. Here’s a little guide I threw together with some built in examples. On the left side, we can see ‘Increase’ and ‘Decrease.’ This refers to increasing the likelihood of a behavior or decreasing the likelihood of a behavior. The positive/negative sections along the top refer to adding or removing something from the environment to increase or decrease a behavior. We’ll walk through each example – if I do my chores and that allows me to collect my allowance, then I have been positively reinforced. The act of paying me for my work (adding something) is reinforcing the work behavior (increasing the behavior). Next, I hear a squeaking hinge on my door which is annoying me. After the squeaking begins, I’m more likely to grease it. This is negative reinforcement, because it is increasing the likelihood of fixing the hinge which will remove the squeak from my environment. I’m not as likely to fix the hinge when it is not making any sounds at all. The presence of the annoying sound is increasing the ‘fixing the hinge’ behavior, thus it is a form of reinforcement. Punishment, on the other hand, aims to decrease target behaviors. For positive punishment – if I fail to complete all my chores, I may get extra chores given to me. The behavior of ‘failing to do my chores’ will hopefully decrease as a result. 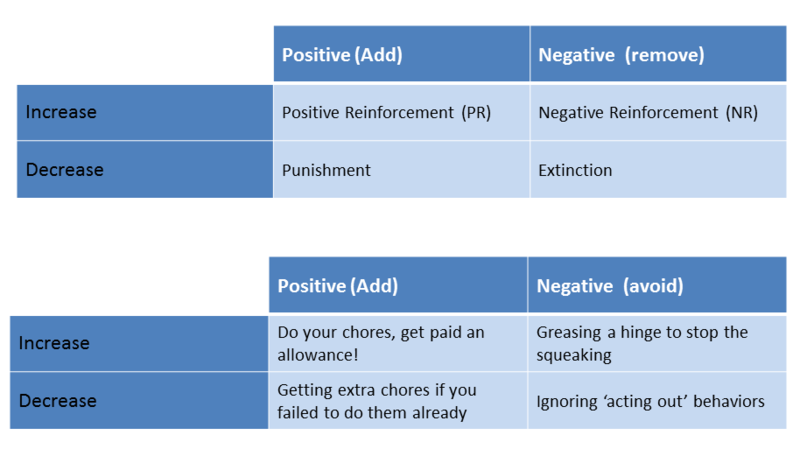 We are adding extra chores (positive) in hope that I will not fail to do them (decrease my failure rate) – thus it is positive punishment. Extinction is a form of negative punishment, and it is a bit different. Imagine a child is acting out for the sake of attention. The child in question might be throwing stuffed animals at the wall, and every time they do, you would enter their room and ask them to stop. The child finds this amusing, but you find it annoying. After a while, you simply stop going into their room to ask them to quit. You would now be using a form of negative punishment – extinction. If a behavior that was reinforced suddenly stops receiving its reinforcement, the behavior tends to stop (it becomes extinct). As the child is no longer getting reinforced for throwing the stuffed animals at the wall by gaining your attention, the child will likely stop the behavior. Now that we have a good understanding of punishment and reinforcement, we’ll move on to schedules of reinforcement. Schedules of reinforcement are fairly simple. I’m going to review top three most commons ones we see in operant conditioning. Continuous – this gets the most consistent rate of response. Every time an action occurs, the individual is reinforced. For example, when the dog sits down, I give it a treat. If I stop reinforcing the behavior, it can be viewed as a negative punishment, which will lead to an extinction of the behavior. Technically speaking, if the resulting reinforcement is even lowered, it may lead to extinction. Imagine you have been getting paid $60,000 dollars a year for your job, then suddenly you are told your pay is getting cut to $20,000 a year? While many people would be happy to have consistent work, it’s hard for the lower amount to be reinforcing as we have associated a much larger reinforcer with the old behavior. Interval – This is how most of us get reinforced when we go to work. Every two weeks or so, you get a paid for your work. Some suggest that work productivity is a bit higher around pay days, and less so during the non-paying week. This would make sense according to operant condition. The further you are from the key interval the less vigorous your response rate will be. Imagine you had to push a button 300 times in an experiment to get $20. The first 250 presses would go by a bit slow, but as you approached the “home stretch” you might buckle down and hit it as fast as you can until you hit the goal. Then you would slow down again. At least, that’s the idea! Variable – Imagine you were no longer paid at the two-week interval at your work. Instead, each day you worked you had a 10% chance to get paid for two weeks of work, regardless of how long it has been since your last check. Potentially, you could get paid every day you work there, or perhaps not at all. What would that do for your attendance? Most people would never miss a day of work in that case. This isn’t a good method of paying people, of course, as being able to predictably pay my bills is very important. Variable reinforcement will get a consistently vigorous response – it’s just like gambling! Schedules of reinforcement, and operant conditioning are things that affect us each and every day. Though a psychologist may use different terminology than other folks, we should all be fairly familiar with these examples. Understanding what we wish to do (increase or decrease a behavior) will allows us to develop strategies for learning. When we are talking about education, however, how should we use these tools? Punishment and reinforcement are both learning tools, and both are easily misused. In a future post I will be discussing in more depth why we should take care of how we praise and punish behaviors. PARENTS DON’T MATTER!? – Perhaps a strange choice of topic just on the heels of Mother’s day! If my last post is any indication, parents clearly do matter (“If you spare the rod do you spoil the child?” – the dangers of physical discipline). So what’s this “debate” all about? It’s an interesting look at a bit of research from Judith Harris, and you’d be surprised at how many good points she makes (even if she does support a rather extreme notion). Before we get into her theory, we have to cover the basics. When talking about parenting outcomes we tend to think about nature and nurture; the environment – including parenting behaviors, social groups, physical place (all-encompassing nurture) versus the genetic forces (nature). With parental influence, though, we are only talking about a subsection of nurture. We tend to believe that this subsection accounts for a lot of behavior, but it might not! My post on Gottlieb’s epigenesis describes the “nature versus nurture” debate in much more depth! Remember back when you were younger and still going school. If you were like me, you might have gone to a public school with a fairly large class. As I lived in the greater Houston area, my graduating class was over 500. I’ve met folks from larger and smaller schools, and we have all had a somewhat similar experience with our social groups. If you were like me, you definitely valued your individualism, but you definitely didn’t want to be alienated. Alienation, that crushing feeling that you are all alone in your world, your views, your motivations, can really be devastating. Strangely, alienation is actually a sociological term coined by Marx in the 1800s, and psychologists may refer to it today as social isolation. Further, Durkheim’s research described links between alienation and suicides in his work in the late 1800s. It’s fairly obvious how such a force could lead to acute depression. That’s enough sociology for now – let’s get back to psychology! Thinking back to your days in middle and high school, did you care about what people thought of you? I know I did not care what some people of my “out-group” thought of me, but the opinions of my “in-group” did matter. In social psychology, the out-group is seen a mostly heterogeneous mass of people who share a common factor. In truth, no group is so simply organized, but this is how we tend to group people automatically. Thus, I did not care what the “jocks” thought of me, I did not care what the “preps” thought of me, I did not care what the “punks” thought of me, but I did care what the “band nerds” thought of me. Ah yes, I was in band, and I was proud to be a geek. I saw my friends as unique and interesting individuals whose time I enjoyed. If they thought I was annoying, a burden, a jerk, or anything negative, I would attempt to change my behavior to be more accepted. I think it’s fair to say we don’t expect to be liked by everyone, but we did have a group to which we belonged. Whether it was 100 people, or just a small handful of close friends, we wanted to be accepted by the people who matter to us. Now in my explanation just now, I hope you were able to imagine those people who helped shaped who you are. I didn’t mention your parents at all, because let’s face it – Did you care more about your friends’ opinions about your behaviors, or your parents? You actually spent more time with your peer group than you did at home (if we exclude the hours you sleep of course). Even when your parents were home, they probably didn’t devote every second to you and they probably didn’t need to anyways. Most of us could handle ourselves on our own to a large degree. This is essentially the point Harris is making. Our peer groups play a larger role in shaping our identity once we start going to school regularly. After successful attachment, we are going to be exposed to an environment which punishes and rewards certain behavior in a social manner. Our species fails to thrive in states of alienation (or social isolation), thus we tend to follow the expectations of our peer group more often than not. Granted, we tend to align ourselves with peer groups with which we share a lot in common in the first place. Otherwise we experience a lot of dissonance between our natural personality and the one forcing us to use free traits (See Brian Little’s Free Trait theory). Here’s an example from Harris’ book, “The Nature Assumption.” Below we see five groups with different levels of externalizing behaviors (acting aggressively towards one’s peers either verbally or physically). Three of the groups are receiving an in-home intervention to help reduce externalizing behaviors, while the control groups are not receiving any intervention. 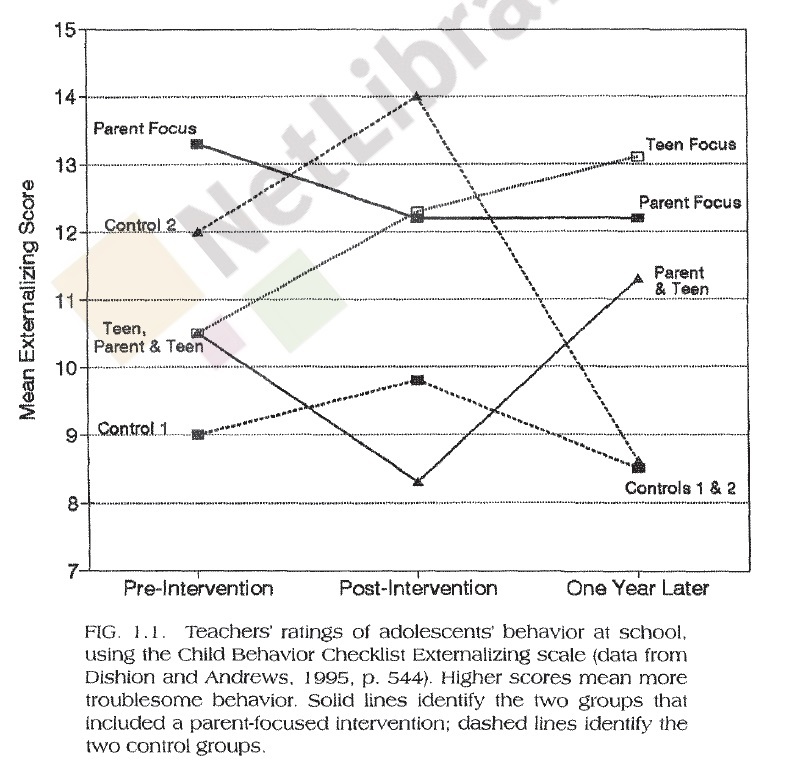 One intervention group focused on the parents’ behavior at home (parent focus), another group focused on the teen behavior at home (Teen Focus), another group combined an intervention for parent & teen behavior at home (Parent & Teen group), and there were two control groups with differing levels of externalizing that received no intervention. The chart may seem a bit confusing. We would expect that the “Parent,” “Teen,” and “Parent & Teen” groups would show a reduction in externalizing behaviors one year later, but they do not. We see that the control groups have the lowest level of externalizing behaviors. According to Harris, we are observing random fluctuations over time. Some may argue that the intervention simply wasn’t good enough, but to Harris, the outcome that was observed is essentially the only outcome that we should expect (a random outcome) when the intervention takes place in the wrong context. That is just one example of parental influences not being observed. A few more examples are outlined in this video clip from Steven Pinker who summarizes Harris’ point of view and provides more research evidence about the limitations of parental influence. It does sound like parent’s do not do much after successful attachment. Certainly, extremely negative parenting styles will change the behavior of the child, but according to Harris’ view, we wouldn’t expect much of an effect on behavior in the absence of trauma. Judith Harris and other researchers fail to mention one very special ability that parents have that can drastically shape the child. The parent has the authority and power (if within their means) to change the environment to which the child will be exposed. If a parent feels that the wrong behaviors will be encouraged in a given environment, they may be best to change environments. If one school is notorious for violent behaviors, criminal activity, and drug abuse, while another local school is not, why risk exposing the child to those behaviors? Once again, not everyone has this option, but it is one powerful effect which the parent can control. A few other factors are not mentioned by Harris. Parental involvement, for example, is correlated with academic success (Houtenville & Conway 2008) That is, parents who are aware of the child’s current school work, goals, projects, tests, and grades are considered to be involved. Children with involved parents typically have higher scores in school, and clearly your scores in school certainly change your opportunities. In my most recent post, physical discipline was shown to have negative outcomes. I discussed how it leads to an increase in externalizing behavior to their peers, and other behavioral problems. Clearly, the behavior of the parents absolutely matters, but it is probably not as powerful as we thought it was. As we can see, there is a lot that can be debated with this topic. As I mentioned before, Harris’ work shows us one factor that parents can use to their advantage (even though it’s more of a blind spot in her theory). The parent has executive control over what the child is experiencing. If a parent sees the wrong behaviors occurring, a simple (and sometimes not so simple) change in environment can drastically change the developmental trajectory. Parents clearly do matter, but not always in the way we expect! If you spare the rod, do you spoil the child? March 28, 2013 8:03 am / 20 Comments on If you spare the rod, do you spoil the child? Conventional, folk psychology… we meet again! Folk psychology encompasses the sayings our culture has passed down through the ages like, “birds of a feather flock together.” They don’t always agree though! How about “opposites attract”? Well, contemporary psychology has answers to the colloquial sayings, but the function of an “availability heuristic” tends to change our opinion on things (as well as reduce dissonance). According to the Five Principals of Liking, however, we know that similarity is of major importance. Opposites may be interested in learning more of each other, but the relationship will not be as strong as two individuals with more in common. Thus, we have to say that opposites may pique interest, but that’s about it. While my last example may be benign, think about this conversation of a mother, who is raising a four-year-old, who is speaking to her own mother (the grand mother of the child). In this instance we are talking about child abuse to inflict physical pain on an individual who lacks the ability to defend themselves, and they lack the ability to fully control their own behavior. As children do not have a fully developed Theory of Mind, it’s absurd to use martial discipline to change their behavior. It’s very important to keep in mind what sort of message we send our children when we use physical discipline. What, precisely, is this interaction teaching the child? Advocates of physical discipline may feel it teaches children to be respectful, it allows a parent to instruct the child without question, and it gives the child discipline in the future. There is no evidence to support this notion. It’s unfortunate that such an idea is still prevalent in this age. Let’s look at a simple scenario, first from the parent’s point of view, then from the child’s. This will help us understand what they are learning from the interaction. The parent comes home from a long days work and there sits six-year-old Billy, with chocolate all over his face. Billy’s parent was quite upset because Billy has been told time and time again that candy is not to be eaten except after supper! It seems obvious that the message has not stuck, so Billy’s parent feels like the only way to make this message clear is with a spanking. Billy is spanked, and his parents tells him why they are spanking him and what is expected of him. From this example we can see that the parent felt they had done everything they could do to explain the situation, thus they needed to add some “weight” to their rules. The parent now assumes that Billy will think twice before disobeying again. The story is a bit different from Billy’s point of view. Six-year-old Billy is waiting around for his parents to come home. He sees something sitting in the fridge, a chocolate bar. Billy knows that his parents do not want him to eat candy until after dinner, but he’s unable to stop fixating on this candy. The more external reasons (rules made by parents) there are to avoid a behavior, the harder it is to resist it (justification of effort). Further, this forbidden item is sitting there right within his grasp, and before too long, his impulses get the better of him. Is this because he has no respect for his parents? No, it’s because his prefrontal cortex has such a long way to go before it is developed (it finishes developing in our 20s!!!!!!). His parents come home, they are mad at him for breaking a rule, and they feel as if they need to punish him. This is not the message the parents intends to convey, but it is the most salient idea the child learns from the behavior. What does this lesson teach the child? Externalizing behaviors and anti-social behaviors. Landsford et. al. (2009) describe the following effects of children exposed to high levels of physical discipline. Externalizing behaviors can be described as “lashing out.” When someone does not deal with negative emotions well, they tend to verbally, or physically abuse someone or their property. This goes hand-in-hand with anti-social behaviors, which are behaviors that completely disregard the effect one’s behaviors will have on other people. To summarize, we see that children who are punished physically are more likely to take out their frustrations on their peers, and when they do not get their way, they see violence as an acceptable method of persuasion. That’s an incredibly dangerous combination. Benjet and Kazdin (2003) make a great point in their review of the “spanking” controversy by describing effective methods of behavioral change without the negative outcomes. “More palatable alternatives, on the other hand, are well established for shaping child behavior. Mild noncorporal punishment such as time out and loss of privileges in the context of contingent positive reinforcement (use of praise and rewards) can accomplish the goals for which spanking is usually employed without the negative outcomes. ” (p. 221). As we can plainly see, sparing the rod does not spoil the child. Punishing a child by using corporal punishment creates a child who is more likely to use physical aggression as a method of persuasion. Certainly not every child who was raised with physical discipline developed problems. In fact, we may all know some people who are positively flourishing in spite of an abusive past. It seems likely that such abuse made their overall development more difficult, but by no means impossible. However, did the behavior of their parents help shape them into the person they are today, or was their success shaped more by their peers than anyone else? Corina, B., & Alan, K. (2003). Spanking children: the controversies, findings, and new directions. Clinical Psychology Review, 23(5), 197-224. Lansford, J., Dodge, K., Pettit, G., Criss, M., Shaw, D., Bates, J., (2009). Trajectories of physical discipline: early childhood antecedents and developmental outcomes.Child Development, 80(5), 1385-1402.